Commuting patterns are the result of where people live, where they work, and how they travel between the two. Workplaces may only take up a fraction of land, but their location is clearly critical to the transport system. Do we want offices to be concentrated in a few locations, spread about evenly, or something in-between? The dominant economic force seems to be to concentrate offices in a few locations. Businesses like to be near customers and suppliers, and like the flexibility to grow and acquire staff and space that comes from being part of an agglomeration. Staff like the flexibility, and also direct access to shops, banks, and places to eat and drink. This is why offices have traditionally located in city centres. Above a certain size of city, there needs to be public transport, but this works reasonably well, given all-day demand, and priority over cars. But it can be difficult to get enough priority over cars. The public transport priority problem is particularly acute where a city’s expansion has been restrained by a green belt. It is harder to make public transport from outside the city competitive, because the higher speeds in the countryside mean that urban priority has less impact. Railways can be competitive, if the distance is far enough (maybe 10 miles), but buses will need very clear priority to be competitive. In recent decades, there has been a growth in business parks, where cheaper offices are offered on an out-of-town site, sometimes with some form of tax incentive. Almost all access is by car, and people drive from miles around. On a small scale this works well-enough, but as the business park expands, the road network becomes unable to cope, leading to chronic congestion (and demands for ever more capacity). There have also been large-scale developments on suburban sites, particularly hospitals and universities. These also tend to be accessed by car, but the congestion effects are usually more immediate. In Oxford it has proved possible to impose parking restrictions at the large institutions. Many people live close enough to walk (or cycle), and many others can use public transport or Park & Ride. The restrictions are unpopular amongst the staff, but can be made to work. The dominant tendency seems to be for employment locations to agglomerate. As such it makes sense to focus on city centres, and to make them work in public transport terms. Employment growth should also be focused on city centres, even if that means more people commuting from outside; at least then there is a fair chance that they will commute by public transport. This does not mean that all jobs should be in the city centre. A reasonable concentration of jobs in smaller towns will give people access to local employment, and the number who drive in from outside will probably be tolerable. What should be avoided is creating concentrations of employment with a wide catchment, and not particularly drawing their workforce from adjacent settlements; that will overload the road network. The data for Oxfordshire shows how Oxford dominates (even though Headington and Cowley have been separated out), but there are other significant centres of employment. Oxford is distinguished by having an unusually low driving share, markedly lower than any other location. Headington is also noticeably low. 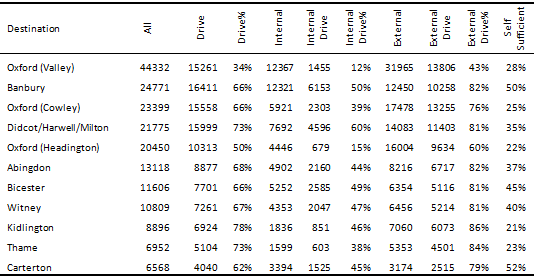 The internal driving modal shares vary, dramatically, from 12% for Oxford to 60% for Didcot/Harwell/Milton. The external driving modal shares are almost uniformly high, with only Oxford and Headington differing from the norm. I have calculated a self-sufficiency ratio – the percentage of a town’s employees who live locally. If you combine the three Oxford areas, their joint self-sufficiency is 48%. The most striking result is that all the other towns are as dependent or even more dependent on commuters from outside. People aren’t just commuting into Oxford, they are commuting in large numbers into every employment centre (and most of them are driving). Does this create a problem? We know there are horrendous congestion problems around Oxford, so there needs to be further improvements to public transport. Where else is it a problem? The worst concentration is around Didcot/Harwell/Milton, both because it is large, but also because a lot of the traffic is concentrated on the A34. The other location with a particular problem is Kidlington, where the self-sufficiency ratio is very low. In both cases, major employment sites have been developed outside the town, rather than organically. The solution for both Didcot and Kidlington is to actively seek to integrate the employment sites into the towns, with excellent walking and cycling provision, new housing conveniently placed for the employment site, and new public transport links. In the case of Kidlington, it would probably be better if some of the employment land was converted to housing.